I’ve often contemplated starting a blog, but was never sure what I could possibly write about on a regular basis. I’m still not entirely sure what this blog will ultimately become, but I figured I might as well give it a try. I’m learning as I go, so I apologize in advance for the lack of really snazzy formatting or interesting pictures. I guess I’ll start by answering a few questions you might have right now. First, who am I? I’m a woman in my mid-30s, who leads a mostly average existence. I love to sing–I belong to two choirs and also enjoy karaoke (when I have time). I have a black belt in Tang Soo Do. I love to read and do some writing of my own. I struggle with my weight and the body issues that come with it. I probably know way more about hair care than I should. I’ve been slowly morphing into a bit of a skincare/makeup addict. I’m single and occasionally venture out into the dating world. I was that nerd in school. Last year I was diagnosed with ADD. Two weeks ago I was diagnosed with Bipolar Disorder, type 2. I mention all of these things because I have a feeling I will write more extensively on all of them. Your second question is probably about the title of my blog. 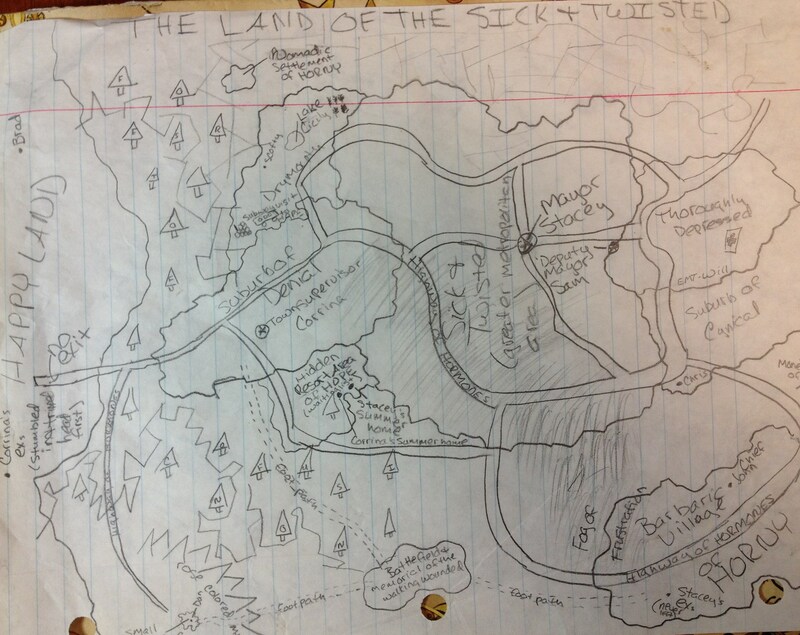 During my last semester of college (1999), my friend and I drew a map of a place we called Sick and Twisted. The different regions were named for different dramas we had experienced, particularly when it came to dating. I used to keep a copy of the map in my office with pushpins labeled with peoples’ names. Based on whatever was going on, my friends and I were moved around on the map. A few years after I graduated, I found myself on a bit of an emotional roller coaster. Sick and Twisted was resurrected and became symbolic of my ups and downs during that time. I also decided that a novel was in order, although it would be almost 10 years before I was ready to sit down and start writing. So that’s the short version of my story. I’m going to end here today, since I have to leave for choir practice soon (choir requires its own series of posts). Thanks, Julie! I figured it couldn’t hurt and might help. Hopefully it will be a bit therapeutic (more on that in tomorrow’s post). I’m also hoping that it helps relieve the writer’s block I’ve had lately with Tales from Sick and Twisted (the novel). Great start-your writing flows beautifully, and I am not just saying that.